Firestorm 4.7.7: get ready to update! Thursday, March 17th saw Firestorm release version 4.7.7.408706 of their viewer. Coming four months after the last release, this update is slightly later than planned, but includes a number of important updates from the Lab as well as a good mix of updates, improvements and fixes directly from the Firestorm team and contributors. As per my usual MO, what follows is an overview of the release, highlighting some of the more significant / interesting changes, updates and fixes to be found in the release, and which I feel will be of most interest to users. This update means that Firestorm 4.6.9 will be blocked in approximately 3 weeks time. Firestorm 4.7.7 brings the viewer up to parity with the Lab’s 4.0.1 code base, and so includes the TLS 1.2 and CEF changes. These and other Lab derived changes are outlined below. The reason this release might be regarded as becoming a mandatory update for Second Life users is the integration of TLS1.2 into the viewer – and by “viewer”, I mean all current or upcoming viewer releases, LL or TPV. TLS, the successor to Secure Sockets Layer (SSL), is a cryptographic protocol for communications security intended to provide privacy and data integrity between two communicating computer application (such as the viewer and the Lab’s servers). TLS 1.2 is currently being implemented by Linden Lab under the umbrella of their work of fiscal compliance, This involved changes to both the viewer and LL’s servers, the upshot of which means that, once TLS 1.2 has been fully implemented, any viewer that does not support TLS 1.2, will not be able to do any interactions with cashier or anything that involves L$. While there is no precise time frame for this work to be completed, indications from the Lab are that it will be sooner rather than later. Again, this is not an arbitrary decision on the part of either the Firestorm team or Linden Lab; the work is being carried out as a compliance requirement. Firestorm 4.7.7 includes the Lab’s implementation of Chromium Embedded Framework (CEF) for media management (and more). CEF completely replaces the old llQTwebkit for media management within the viewer, replacing it with current web technologies such as HTML5, CSS3 support and WebGL, which can allow direct manipulation of objects on a browser page displayed in-world with ease. CEF should also enable things like viewing PDF files in-world, editing PDF documents via Google Docs, etc. See the CEF forum thread for more. CEF integration into the viewer means that Flash and QuickTime content require third-party support (see this Knowledge Base article on enabling Flash support for CEF viewers, for example). However, because they do rely on plug-in support, there is no guarantee given by Firestorm or Linden Lab that either will work, and are regarded as unsupported. 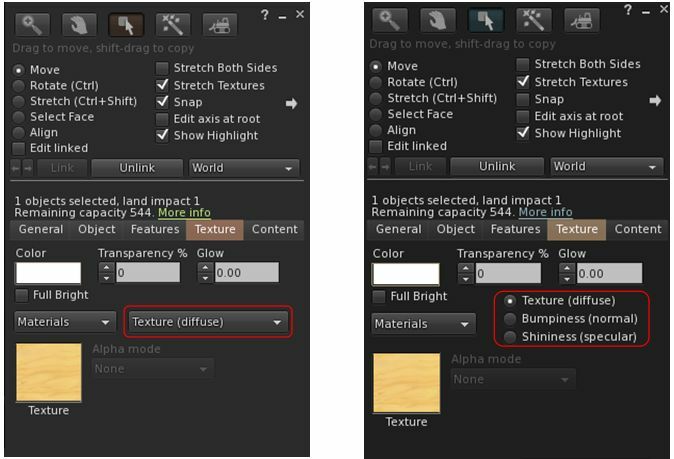 Materials (texture / diffuse, bumpiness / normal and shininess / specular) in the Build floater Texture tab can now be selected via radio buttons, rather than picking from a drop-down list, to make locating and selection them easier (see BUG-10149). A fix for opening an experience compiled script in an object in an adjacent region failing to show the script is compiled with an experience in the script editor (see BUG-8980). The following general updates have been made to the Preferences floater. additional updates related to specific functionality (building, chat, etc., can be found in the sections that follow this one. 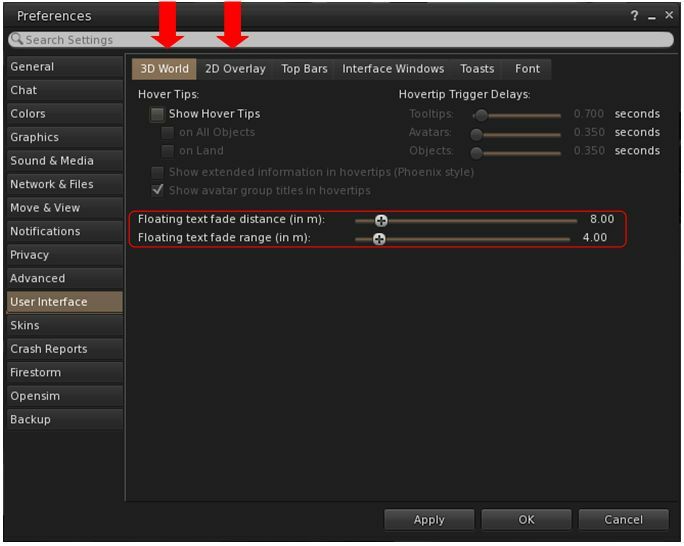 Support for Legacy Notifications: those who prefer not to use the new Notifications floater from Linden Lab, and introduced with Firestorm 4.7.5 can now revert to the legacy notifications display via Preferences > User Interface > 2D Overlay > Use legacy list layout for Notifications window. 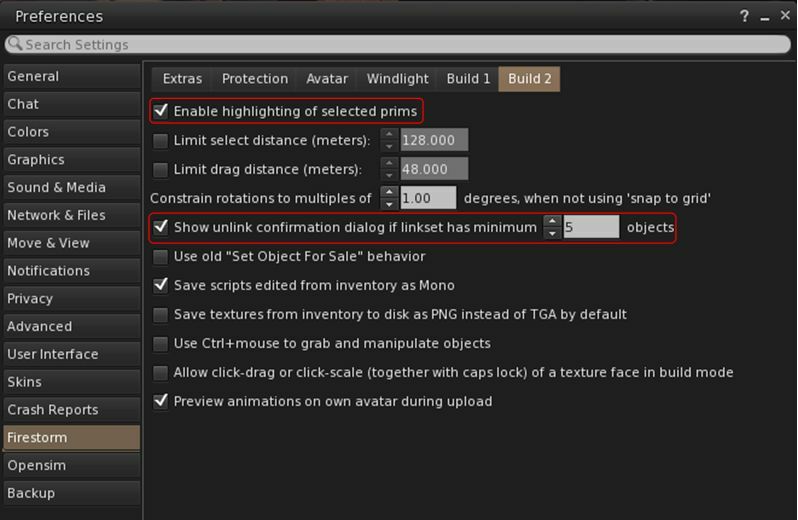 Building and scripting updates include, but are not necessarily limited to, the following. The Animation Upload floater now displays the number of frames, total duration, and FPS of the .BVH file selected for upload. The upload floater also includes two new Frame In and Frame Out spinners for grater accuracy when defining the loop in / out parameters for the animation. These work in sync with the existing % In and Out spinners. Fixes facial expressions not working for most languages (see FIRE-17261). Exposed Boost exceptions to the PreProcessor output. The communications and group updates include, but are not necessarily limited to, the following. All chat and IM floaters now include a Chat Options button which provides quick access to a number of chat options and settings via drop-down lists. 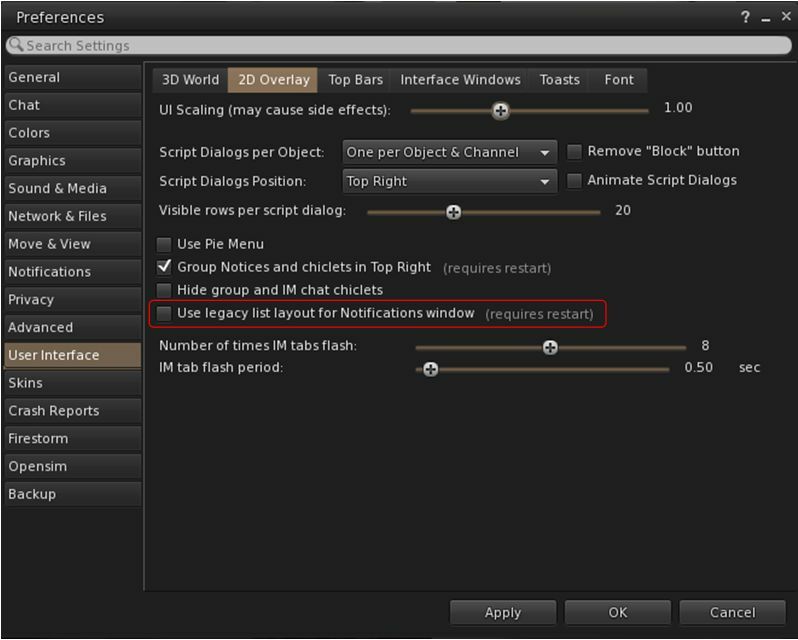 These are a mix of global options (displayed for both local chat and IMs), and context-sensitive options, depending on whether you are using the local chat window or and IM window or a group IM window. Growl will no longer notify if Do Not Disturb is set in the viewer. Group invitations now exempted from the newline flood check because some group invites were being blocked when spam protection was enabled (see FIRE-17478). Inventory updates include, but are not necessarily limited to, the following. With this release, Firestorm handles Calling Cards the same way as V1-style viewers: if you delete them they will not regenerate from your Friends list when you next log-in. However, if you log-in to Second Life using a different v3/v4-based viewer, your list of Calling Cards will be recreated. In addition, a number of fixes have been made to try to eliminate the unnecessary duplication of Calling Cards in your inventory, and a fix has been added to prevent inventory sometimes popping up and selecting a calling card after logging-in, should Calling cards get synchronised for whatever reason. 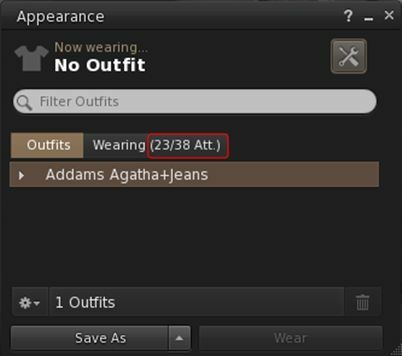 Attachment count added to Wearing tab in the Appearance panel (Avatar > Appearance > Wearing tab). Other updates in the Firestorm 4.7.7 release include, but are not limited to the following. Again, for a complete list of updates, please refer to the release notes. 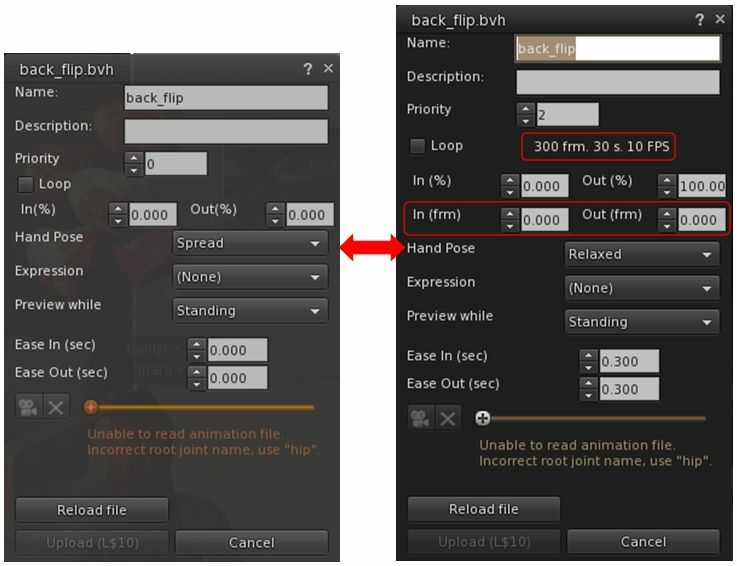 A fix for Object Z-position spinner in tools floater not allowing negative values for OpenSim (see FIRE-13582). A large update, and one which packs a couple of significant updates into it from the Lab in the form of CEF and the TLS 1.2 code. I’ve been running Firestorm 4.7.7. 48706 for the past few weeks and have personally have few problems with it. Rendering seems to be slightly bumpy at times, but frame rates show a slight improvement over 4.7.5 in very rough-and-ready tests. Again, given I’m fortunate to have a relatively good-to-high-end system, my findings may not reflect those of others. I’m also out of time. The release is live – as should be this blog post! Thanks for sharing! 🙂 . like the last firestorm, the firestorm exe fix to allow it to work on windows. where is it fore the new viewer? Bring on the new changes! Thanks for sharing 🙂 . Thanks for the overview and summary! The 4.7.7 is the best Firestorm viewer to date. Its more stable than the 4.7.5 , which needed the APPFIX for texture graphics stability. The good part about the 4.7.7 is the “extra” MB’s at download & without using the APPFIX. I’m late to the party, having downloaded 4.7.7 just before the June 15 deadline amidst dire warnings about money transactions. Little things: At login, no longer are we told how many users are inworld, and the IM window has been narrowed so that unless one stretches the window absurdly wide, one can only see a very few words as one types. I see no reason for these irritating changes … maybe someone here knows? 1) The login screen ticker was broken with the CEF changes. This will be fixed for next release. 2) I’m not really sure what you mean here & nothing has changed with the layout of the text entry box for local/IM/Group chat for many releases. The width of the chat entry box is governed by how wide your conversation window is. There is a resize handle at the bottom right of the conversation window. There is nothing else that governs the width of the text entry box. If you mean the *height* of the text entry box, possibly you have the viewer set to have the multi-line chat entry disabled, so the chat bar will not expand in height as you type. Advanced -> Show debug settings -> FSUseSingleLineChatEntry -> Make sure this is set to FALSE. If that doesn’t fix the problem, can you post a screenshot showing the problem please. Which viewer version did you update from? Actually, thought of something else that may be the problem if you updated from the very very old Firestorm 4.4.2 & you like your conversation window super narrow. 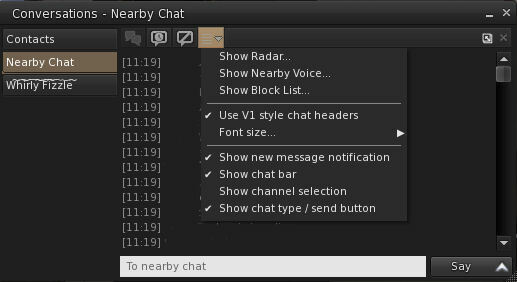 Since that old release the send button was added to the right of the chat entry box, plus the channel selector for nearby chat. You can disable both of these. Preferences -> Chat -> Typing -> Show Send button in chat bar for IM sessions. Preferences -> Chat -> Typing -> Show chat type / send chat button in chat bar (this is for nearby chat). Preferences -> Chat -> Typing -> Show channel selection in chat bar. Disable those 3 options & you’ll get some extra width in the text entry box. The settings solution worked. Thanks, Whirly.